I have been meaning to post these for the last few weeks but for NM's epic proposal evening, part of it involved decorating his flat with cute typographic posters. There were 6 in total but here are 4 of my favourites. I love that they are all from etsy...and apparently people were so lovely about it when he told them he was going to use them as part of his proposal. Etsy has such a great community vibe. 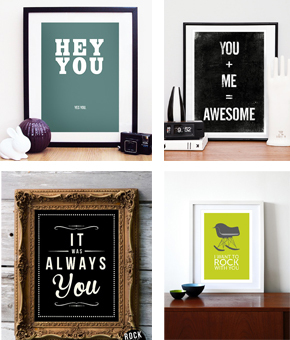 Find the above posters here: Hey You, You + Me = Awesome, It was always you (this was my absolute favourite) and I want to rock with you! Letterpress - The Final Week!